Posted on September 18th, in Events. You are cordially invited to a reception to benefit ICE-PAC’S mission and help support excellent candidates for office this Fall! Join us for lively conversation, engaging speakers, cocktails, and heavy hors d’oeuvres in a beautiful setting as we raise funds for a great cause… To elect and re-elect politicians of integrity who support mainstream values important for Life and Family. 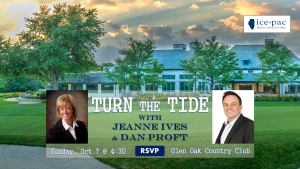 Plus, State Representative and former Gubernatorial Candidate Jeanne Ives, and Talk Show Host Dan Proft, will mingle with guests and give short talks on the state of politics today and hope for the future. Plus, we’ll share some big news on the direction of our organization. ICE-PAC is on the front lines defending outstanding pro-life candidates against the Madigan Machine and the abortion lobby. Great pro-life/pro-family representatives are under attack this year, fueled by money from the abortion lobby. Check out this news coverage of Peter Breen. It will give you a sense of what they’re up against this fall. They’ve got millions, but we have a track record of wins when good people like you give generously and get involved. Help us turn the tide to victory this Fall!